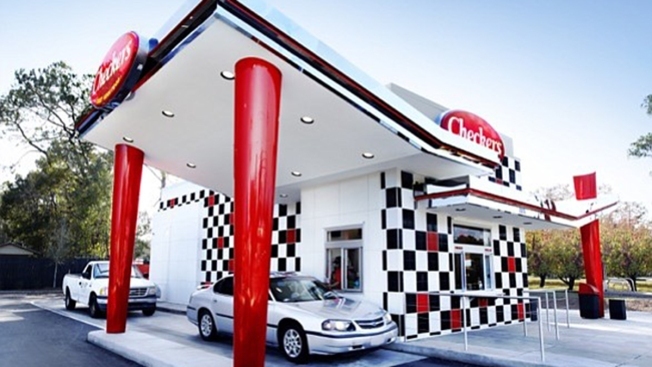 Photo courtesy of Checkers Drive-in Restaurants Inc.
Checkers and Rally’s restaurants include service via double drive-thru lanes. Photo courtesy of Checkers Drive-in Restaurants Inc. Authorities say a Florida man ordered a combo meal at a Checkers restaurant but rolled up to the drive-thru window pointing a gun instead of handing over his cash. The Daytona Beach News-Journal reports that the gunman told an employee he wanted all the money in the cash register. Police say the employee ran to the back of the restaurant and told a colleague to call 911. Police say while the employee was away, the gunman got out of a late-model Chrysler 200 and stole an undisclosed amount of money from the cash register. Employees did not see him steal the money, but they heard the sounds of coins dropping onto the floor and noticed cash missing from the drawer after the incident, police said.